By removing the billboards and advertisement hoardings, Corporation attempts to give a clear message to the public that it shouldn’t be tolerated and rigorous actions will be taken. 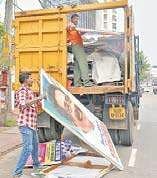 THIRUVANANTHAPURAM: On a mission to make the city clean, the Corporation has begun removing unauthorised flexes, billboards, advertisement hoardings and film posters in and around the city. The revenue department of the Corporation and ‘Raqs Media Concept’, which is the official advertisement company of the Corporation for the year 2018-2019 is responsible for the same. “We have started removing the posters and other unlicensed boards. There are 11 zonal offices and we have been divided into two teams. Kizakkekotta to Peroorkkada and Peroorkkada to Kowdiar are the two areas that have been bombarded with illegal hoardings,” said Vincent E, revenue officer, Corporation. According to revenue officials, a public announcement was made initially directing owners to remove their advertisements of all sorts. “Every year the advertisement permit has to be renewed. For that, a certain amount has to be paid according to the size of the poster/billboard (per sq.mt). Once it’s paid, a new sticker will be issued which evince that they have the authority to erect their posters,” said Rakhi Ravikumar, Finance standing committee chairman, Corporation. By removing the billboards and advertisement hoardings, Corporation attempts to give a clear message to the public that it shouldn’t be tolerated and rigorous actions will be taken against those who violate the norms. Even though the High Court directed the removal of all boards that fall under the mandate of the circular before October 15, it could take more time to completely eliminate all illegal posters, according to the Corporation officials. “Our deadlines have been extended to October 19,” added Vincent E, revenue officer, Corporation.